Hurricane Harvey was supposed to be the storm that didn’t discriminate. The recovery is proving otherwise. HOUSTON — The water burbled from the floors of Vickie Carson's cottage in the semirural northern edge of Houston, saturating everything she owned. It seeped through the ceiling of Ebony Harrison's apartment in the impoverished Sunnyside neighborhood, dousing her newborn daughter as she slept. It swept so swiftly into Lidia Peña's rental home in the city’s north side that she and her young son fled without taking any spare clothes. It drove Rick Christie out of his midcentury ranch house in the southwest Houston neighborhood of Meyerland, leaving him to sleep on a couch above his garage. Each of their homes was left uninhabitable by Hurricane Harvey, a Category 4 storm that plowed through southeast Texas in late August. Its floodwaters capsized lives of the comfortable and the struggling, black and white, Latino and Asian. Tens of thousands of people across spectrums of race and income were left without permanent places to live, inspiring a newfound saying: Harvey was the storm that didn’t discriminate. The poorer victims of the storm are now in danger of falling deeper into poverty or homelessness, while the wealthier are expected to rebound more quickly. Those in the middle will now struggle harder to stay afloat. The result could be a deepening of Houston’s economic divides. After surviving for nearly two months on temporary assistance checks from the Federal Emergency Management Agency, many Houstonians are facing dire choices. Displaced renters have found themselves reliant on the whims of landlords or the generosity of friends. Homeowners without flood insurance are in a similar bind, while those who have it are waiting for their claims to go through. Some are maxing out their credit cards, or moving back into damaged houses. The most fortunate, meanwhile — those with good insurance, a long-term place to stay and enough cash — are moving ahead with rebuilding plans. In some prosperous neighborhoods, certain homeowners aren’t bothering to wait for their insurance checks ─ if they had flood insurance at all ─ and are paying their contractors up front. Carson, 55, a school bus driver, bought the single-level cottage in Houston Gardens with her disabled sister 10 years ago, drawn to the neighborhood’s mix of country and city. It was a few hundred feet from Halls Bayou, normally a pleasant meandering stream. The bayou spilled its banks a few hours into the storm, along with the crude roadside ditches that comprised her neighborhood’s drainage system, flooding Carson’s home. At the time, 10 members of her family across three generations were living there, including four children. Most ended up in a water-damaged hotel near George Bush Intercontinental Airport, unsure what would happen after the Nov. 7 expiration of their emergency housing vouchers from FEMA, which covered their rooms. Every day, twice a day, Carson returned to the house to pick through her possessions and decide what she could salvage. There wasn’t much. Her nephews, with help from volunteers from a West Texas church, had stripped the walls to their studs, and the front yard was a jumble of debris: clothing, appliances, chairs, lamps, children’s toys, books, DVDs. She moved through the piles silently, limping on an aching knee while industrial fans roared inside. She had flood insurance, but was still waiting for word on her claim. She was seeking a contractor willing to start the work, one room at a time, one small payment at a time. The speed of recovery for people like Carson has a lasting impact on a city’s ability to mend, researchers say. An uneven recovery — where some homes go unrepaired, neighborhoods are neglected, workers can’t get to work and businesses struggle to reopen — can weaken a city’s overall health and make it less resilient to future disasters. Houston is particularly susceptible to this. Before the storm, Houston was a study in contrasts. It is the fourth-largest city in America and also one of the most diverse ─ a place of open arms and unbridled growth. But that progress has not unfolded equitably. A hub for the engineering, energy and medical industries, Houston has attracted two disparate streams of workers: high-skill/high-wage, and low-skill/low-wage. The result is a yawning gap between the well-off and the impoverished, an imbalance made worse by an affordable-housing crisis that includes federal charges of discrimination against minorities. The number of high-poverty neighborhoods in the region has doubled since 1980, according to a study by PolicyLink and the University of Southern California’s Program for Environmental and Regional Equity. Another, by the Pew Research Center, ranked Houston the highest in the nation for “residential segregation by income.” A third, from the Corporation for Enterprise Development, found that more than half of Houston households, including a third of homeowners, did not have enough savings to live above the poverty line for three months if they lost their income. The storm affected about 117,000 homes in Harris County, including 25,000 that suffered major damage. It inundated many areas that weren’t designated as being in a 100-year floodplain, which meant that homeowners weren’t required to have federally backed flood insurance. An estimated 45 percent of Houston households that flooded during Harvey earned less than $50,000, according to a Kinder Institute analysis. About 15 percent earned more than $150,000. Thousands of Harvey’s victims are now scrambling for a piece of a $15 billion federal relief package, a pot that must be shared with survivors of other disasters this year. More than 411,418 Harvey victims have applied for assistance from FEMA, which has given out $591 million to cover their short-term needs, from hotel rooms to personal property replacement to home repairs — about $1,400 per applicant. Long-term assistance, administered by the Department of Housing and Urban Development and distributed by local governments, is aimed at the rebuilding of homes, apartment buildings and small businesses. It’s likely that aid won’t trickle down for months. Or years. For a sense of what it might expect, Houston can look to New York and New Jersey, where, five years after the massive storm known as Sandy, many low-income flooding victims have yet to move back into their homes, while upscale shore towns have sprouted massive new houses built for wealthy buyers. Harrison is among those hoping to avoid that spiral. She is 29, a single mother of two girls, one 6 and the other born in June. 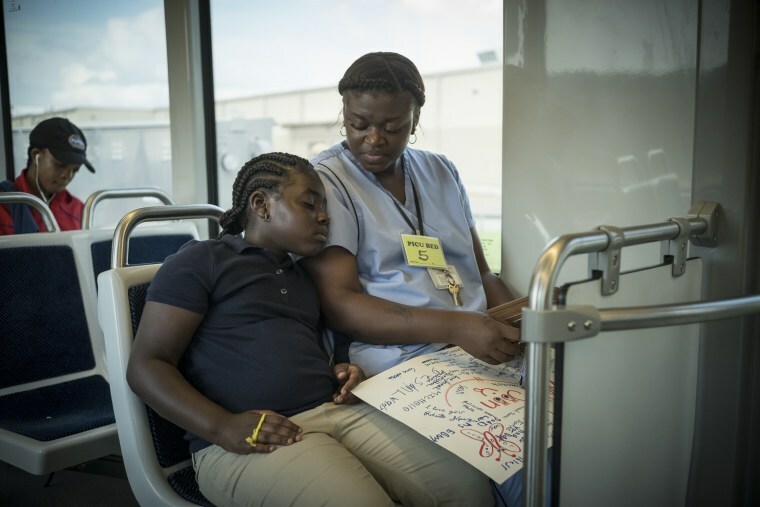 She lives in Sunnyside, a historically African-American neighborhood in south Houston that has one of the city’s highest rates of poverty, crime and unemployment. Her $450-a-month apartment, in an area she describes as drug-infested, didn’t flood during Harvey, but one night, as she and her baby slept, her bedroom ceiling began to leak from all the rain, drenching them. While she waited for her landlord to fix the leak, her infant daughter developed a cough and was hospitalized with a respiratory infection. Harrison said she was with her baby in the pediatric intensive care unit when the landlord texted her saying she had a week to leave the apartment because it was uninhabitable. Harrison, who makes $10 an hour as an attendant at an adult day care facility, applied for aid from FEMA, which gave her $205 to buy a new mattress, and the American Red Cross, which turned her down. Harrison’s boss offered to let her rent a house she owned, a godsend at $500 a month, but it was only a temporary solution. Her daily routine became grueling: up at sunrise, dropping her older daughter off at school, a day of work, picking her daughter up and dropping her off with relatives, then several hours at the hospital with her younger daughter. It left her no time to research other emergency assistance programs. Harrison’s lament describes one of the biggest challenges of post-disaster recovery: whether victims can find a place to live during the months it typically takes for insurance claims to be processed or to receive long-term assistance. But those who need housing aid the most often don’t know what’s available or can’t access it, advocates say. That can mean the difference between stability and freefall. Researchers have developed a method to identify people who need help the most after a disaster, using an analysis of census data to create a “social vulnerability index” of how well communities can withstand calamities. “The utility of this is to say, OK, these are the areas we need to target first as a way to prioritize resources, which eventually will be scarce,” said Susan Cutter, director of the Hazards and Vulnerability Research Institute at the University of South Carolina, who developed the index. In Houston's case, maps show that Harvey's floodwaters deluged some of the city's most economically vulnerable neighborhoods, and some of its least. That could include people like Peña. Peña had no insurance when Harvey flooded her new rental house in Houston’s Near Northside. A single mother of a 7-year-old boy, she lost almost everything, and ended up at her parents’ house nearby. FEMA turned her down for property damage assistance, but gave her $2,452 in emergency aid. She spends her days working at a trucking company and caring for her son, who offered to pay for school clothes from his savings account. The anguish is not limited to the lower ends of the economic scale. Some of the worst flooding from Hurricane Harvey occurred in Houston’s middle-class West Side neighborhoods, where bayous overflowed and reservoirs were deliberately emptied by officials in order to avoid a catastrophic collapse. That included Meyerland, where Rick Christie and his wife raised three children. Their midcentury home was heavily damaged in a 2015 flood, and they completely renovated it. The mortgage was almost paid off when Harvey wrecked it again, a loss that they are still trying to come to terms with. “There’s an emotional side to it, in that you worked that hard, you have so many great memories of when you were there, and … then it’s gone,” said Christie, 55, a former local television producer who now does marketing for a faith-based system of homeless shelters. He rode out the storm with his wife, a son and several neighbors in a one-room apartment above their garage. He stayed there for two weeks, salvaging what he could and arranging for the house to be gutted. Christie’s wife, a financial analyst, worked the phones with their insurance company, and together they decided to demolish the home and build a new one that will be elevated a foot above peak flood levels. Until then, they will stay with her parents, 40 miles north. Christie recognizes how fortunate they are, given what others are going through: They have flood insurance with the maximum amount of coverage, and don’t expect to rely on FEMA. In other parts of west Houston, such as the Memorial neighborhood, some storm survivors are paying upfront for renovation projects. But Christie doesn’t expect his insurance to come close to covering what he lost. On the other side of town, and across the economic divide, Carson said she was glad things weren’t worse. She lost a lot, but not her family, or the bones of a house that she plans to make into a home. It was burglarized, so three weeks ago Carson moved in, alone, occupying a single room while a contractor, whom she paid in small increments, began to rebuild the walls.